If the cryptocurrency market is a bubble right now then it is a very small one! The dotcom bubble started growing in the late '90s, as computing and the internet expanded all over the world. Companies just had to add '.com' to their name and investers were willing to pay huge amounts of money for their stocks without even looking at the profits and revenue of the company. Companies were going to the stock market with IPOs and received big prices, with stocks sometimes doubling on the first day. The value of the NASDAQ grew from around 1,000 points in 1995 to a high of more than 5,000 points in March 2000. What a time, it was insane! I think the same can be said about the current Inintial Coin Offerings (ICOs). Many new digital coins are coming to the crypto markets while the company behind the coins only have made a promise to deliver an interesting blockchain project. At the launch of the ICO their is no working product yet, only a promise to deliver something later. No money is being earned yet. Only time will tell which of these digital coins will have a long life like Amazon.com and which of them will end up as Pets.com (who went bankrupt shortly after the Dotcom bubble bursted). On March 10, 2000, the combined market capitalization of all companies on the NASDAQ was at $6.71 trillion; the crash began March 11. And don't forget $6.71 trillion is only for the companies traded on the NASDAQ in the US. There are many other stock markets worldwide which are not included. As you see... 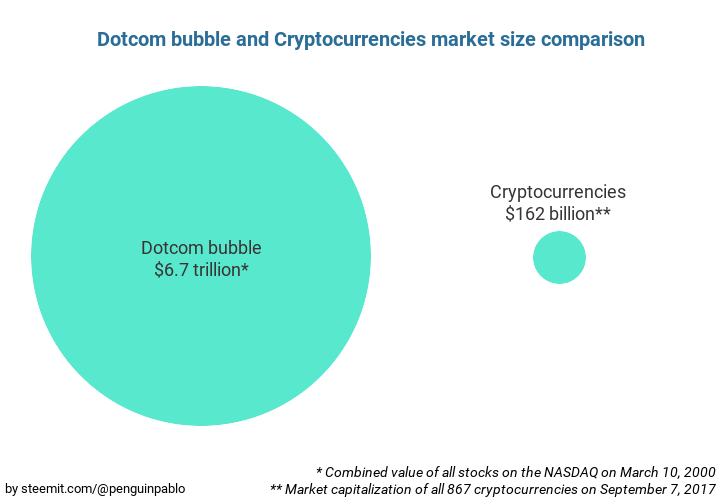 If the cryptocurrency market is currently a bubble then it is a very small one. The volatility of crypto far exceeds that of the dot coms, we have already crashed and risen many times. Have we already forgotten that in July the total market cap hit $60 billion? That was from a previous ATH of almost $120 billion. If a 50% drop in the entire market isn't a "healthy correction" or "market crash" then I don't know what is. Let's compare that to 2008, Dow Jones was 14,000 ATH and then crashed to 6,500 in 2009. Pretty comparable numbers. Even the Great Depression was a 55% stock market crash. The bubbles will burst and they will refill, but to think the entire market is some massive bubble that will burn more than 50% is next to impossible unless a quantum computer hacked every blockchain. And if there was a malicious quantum computer out there I would be far more worried about our military and government computers than cryptocurrencies. It will be governments with the quantum computers doing the hacking! I suspect though that the quantum dream is further away than we think. While crypto's obviously have a very high volatility, I think it's useful to compare their market cap to the fiat money supply. US "M2" money supply (roughly speaking, money in circulation as well as in liquid bank accounts) is currently $13,600B, or roughly 85X more than all crypto's. That's just USD; the Euro M2 is ~$13,300B USD. So just those two currencies are 166x larger. There's a pretty decent amount of room to grow from that standpoint. @penguinpablo, That's a very good comparison. Both the worlds look exactly the same at the moment. As more and more people get familiar with the magic of crypto currecnies, I'm sure this small looking bubble is going to become sizable and it won't take it a lot of time. Keep updating and serving the world the way you're doing. Great job. Great post, thank you for sharing @penguinpablo. This is especially insightful for me, as I was only 5 years old at the time of the dot come bubble. I sure am hoping you are right about this one. Steemit to the moon! I have similar thoughts on this issue. I posted a post discussing the bubble of bitcoin (sorry it is in Chinese), I think if it is a bubble then it will not break in the near future. I think crypto currency bubble won't inflate large enough before regulators step in to shape it up. @OriginalWorks Mention Bot activated by @jpederson96. The @OriginalWorks bot has determined this post by @penguinpablo to be original material and upvoted it! We are scraping the surface. We scare established businesses because the power is to the people. This is the heart and beauty of crypto. Decentralised and blockchain techonology is here to hopefully stay. good article really myself i taught its big bubble today when i see 163billion not knowing that was small fraction compared to those company you mention above. Lets work together to make it bigger! Read this article you will understand a little bit more about this..
That certainly puts things into perspective... It also makes me know that Steem is not a bubble! We've got a working product that's evolving to become one of the greatest social media app out there... Wait until the communities feature is released and the mobile apps soon after... We will end 2017 as a very appealing crypto! Great post, re-steemed and tweeted. I'm always cautious, but think the space still has plenty of room for growth. We haven't even scratched the surface of all this. I agree with you completely. The crypto community is super supportive and strong as well, so I think we all have our eyes wide open! There is something that you might forgetting, the value of any currency depends on the value people agree, if we make the rock value above gold, mining activity will change to rock, gold value goes down to 0. Very interesting article. I am trying to understand crypto currency that this helped alot. Thanks for the post. Yes! even if it was, too early! John Mcafee is even predicting BTC to reach 500K$ in few years! still a lot of room to grow. As a newbie i will be watching and taking advice from you guys the experts. There are many ICOs lauching of late. At the launch of the ICO their is no working product yet, only a promise to deliver something later. No money is being earned yet. Please contact me to email: ks.shilov@gmail.com. Looking for crypto writers. There is no reason that there could not be a bust in cryptocurrencies, but given the unique proposition (regular finance won't catch up soon on the capabilities of 'Wild West' permissionless cryptocurrencies), any bust will be followed again by a boom, upwards to the point of equilibrium (and beyond). If >99% of people have zero crypto holdings, this says everything about the prospect of price growth in the cryptosphere. Just look at Coinbases's recent data on its user-base growth. Prices are only going to rise, albeit with corrections along the way. Great comparison. I'd agree that the current crypto market is not really in huge bubble mania territory, especially given that only a small minority of people have cryptos. To be really in a bubble mania for cryptos, every man and his dog will be speculating! excellent content,Thx for sharing this. Very interesting. Nice, I love that graphic representation, makes you realize where we actually stand. I definitly am very bullish on bitcoin. Cliff High and even the more down-to-earth (leaked) KW Crypto Report point in a similar direction. We're definitely in a bubble but not in "THE" bubble. We have a huge correction to do. Once blockchain projects launch and aren't speculative tokens, that'll start the HUGE crypto bubble which will be worse than dotcom bubble since it will be global. 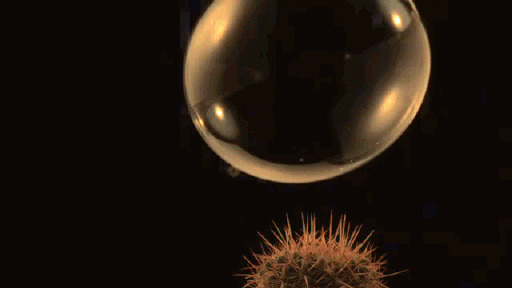 For that big idea bubble to burst eventually would mean that lots of money had been made already. Hehe. My 2 cents worth.